Get your friends together and let the good times roll at Rollerland Skate Center in Fort Collins! Enjoy skating on our smooth 12,000 sq/ft skating floor while listening to your favorite tunes and playing your favorite games. Every session at Rollerland features a live DJ playing the best music, from today’s hits to throwback favorites. With the glow of colorful lights and crowd-pleasing hit music for all ages, you can’t beat the fun, festive atmosphere! We know that not everyone is a pro, so if you are new to skating we have a practice area, as well as “Skate Trainers” to assist you with learning to skate. For those who want to learn the basics or develop their skills further, we even offer roller skating lessons on Thursdays and private lessons by appointment. Healthy fun you can feel! 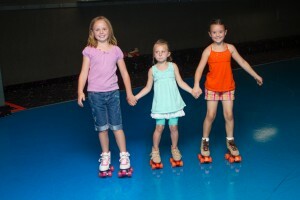 Skating rinks are natural gathering spots, but at Rollerland we take birthday parties and group events to the next level with awesome activities, friendly customer service, great food, and more! Give us a call at 970-482-0497 to discuss your needs for group events in Fort Collins, from school fundraisers to sports team parties to church events.